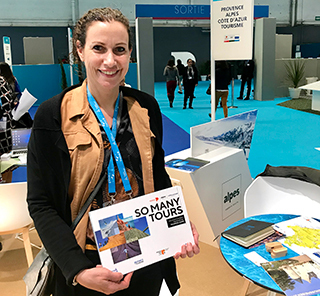 Sophie Dragon, Promotion Executive with the Provence-Alpes-Cote d’Azur tourist board, at the Rendez-vous en France Travel Market 2019. Diane Pothan with CIT Tours on Day 1 of the Rendez-vous en France Travel Market 2019. Some of the Canadian tour operators during lunchtime at the Palais Phocéen. L-R: Michelle Sitbon – Art Voyage, Amelia Borghese – Arts and Leisure Tours, Susan Lawrence – Boutique Escapes, Nadia Matwijiw – Active Journeys, Huguette Bouchard – Vision Voyages Ideal. Some of the Canadian delegation at a gala evening at the Palais du Pharo. 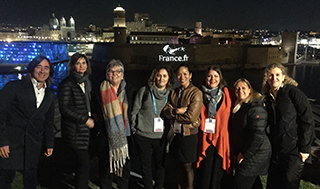 A mistral wind swept the Rendez-vous en France Travel Market 2019 (RDVF) through Marseille from 19-20MAR, blowing in almost 1,000 tour operators and journalists from 73 different countries. 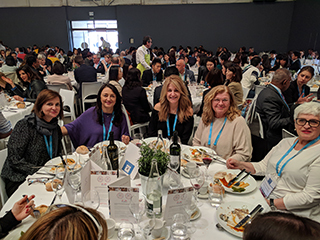 The Canadian delegation consisted of 22 tour operators from across Canada, including Toronto-based operator Kensington Tours which was awarded Product of the Year by Atout France, and Connaissance Travel and Tours, named Partner of the Year. The wind wasn’t just a metaphor -- some of the entertainment planned for the 14th annual Rendez-vous en France opening ceremony at MUCEM -- the first national museum devoted to the Mediterranean -- had to be cancelled due to the strong seasonal gusts. The Palais Phocéen exhibition centre hosted the two-day gathering, where operators had the opportunity to network with 788 exhibitors and learn about destinations to inspire their tour planning. According to Atout France, 25,000 back-to-back 20-minute interviews were scheduled with tourist boards and suppliers across France. “It’s good product, it’s good suppliers, and coming to this show, you really have everything. If we were just starting our France program, we could get all we needed here,” CIT Tours president Diane Pothan told Open Jaw. CIT is trying to grow business in Provence-Alpes-Cote d’Azur, a region that Pothan said holds great potential and interest for her clients. With CIT committed to the travel agent channel, it is important for the company’s representatives to be able to speak knowledgeably about their product offerings. “It gives you more things to talk about. We sell through the travel agents so we rely on the travel agent to express our enthusiasm and the more enthusiastically that we can talk and the more information that we can give, the easier it is for the travel agent to convert a sale,” she says. Terri Beaudry, Group and Incentive Planner with Ellison Travel and Tours, said the marketplace was a chance to discover the region in an in-depth manner that operators aren’t able to do remotely. “I got a lot of contacts and resources out of it that I will use towards my next trip,” she said. 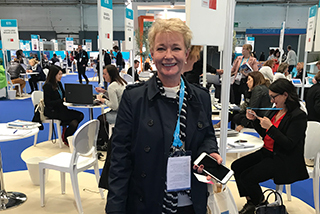 Vision Voyages’ Huguette Bouchard has been attending Rendez-vous en France for several years, and says the trade show offers an opportunity to inspire revised itineraries for France and discover new offerings for her clients. France is an important destination for Vision Voyages – in fact Bouchard said it’s her most popular destination for corporate vacations – so staying in tune with everything from accommodations to activities is vital to continue to offer fresh and exciting tours. Before donning their salon badges and business suits, 350 tour operators had a chance to experience the Provence-Alpes-Cote d’Azur region through one of 26 pre-show familiarization trips. The four days of exploring the mountains, seaside or charming countryside served as a building tool for operators wishing to create tours in the destination. Although there are commonalities throughout the province – mouth-watering gastronomy, fine wines and breathtaking viewscapes -- visitors can experience vastly different activities, tastes and vibes from one region to the next. Luxurious yachts and beaches reign in the Cote d’Azur, while the Alps are famed for their ski resorts. The Provence region is also home to picture-perfect rows of lavender fields and medieval towns. Pothan urges travel agents to probe clients to get the most comprehensive information about what kind of trip best suits their desires. Looking forward to next year’s RDVF, the Loire Valley’s Nantes has been announced as the 15th host city for the marketplace on 24-25MAR 2020.